Platte County seniors (from left) Dakota Schmidt, John Watts, Michael Smith and Tanner Clarkson and coach Bill Utz walk out for the coin toss ahead of a Class 4 semifinal game with Webb City on Saturday, Nov. 18 at Cardinal Stadium in Webb City, Mo.. For more on this and other coverage, see Sports Weekly on pages 7-10. Bill Utz called Saturday’s Class 4 semifinal a chance for Platte County to measure up with one of the state’s elite. The Pirates showed they belong. 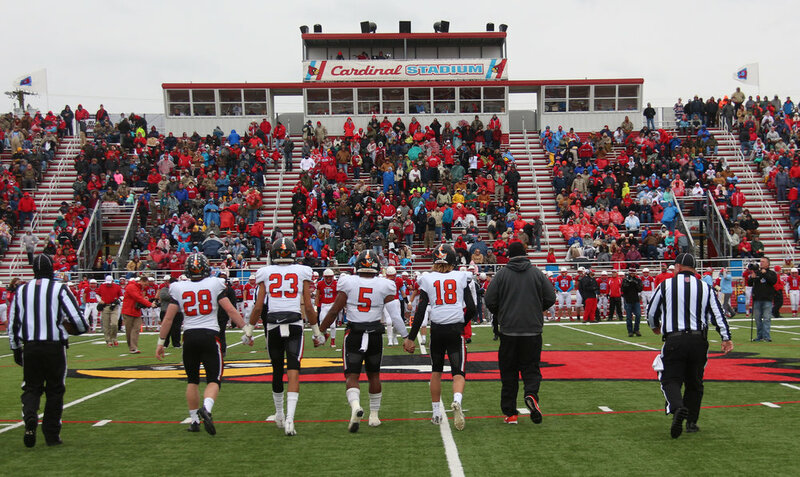 On a cold and rainy turned sun-bleached afternoon, Webb City needed all 48 minutes to finish off a 21-18 victory in front of a mostly packed crowd at Cardinal Stadium — a facility some college programs would envy. Platte County didn’t quite do enough to spring the upset, but the Pirates were right there. Players went through a somber postgame handshake line with the many fans who made the trek south. There will be regrets, but in time, the true nature of this accomplishment should be cherished. Long a consistent winner, Platte County struggled in the past decade to find footing. The Pirates moved up from Class 3 to Class 4 and didn’t immediately experience the same level of success. Chip Sherman — recently inducted into the Missouri Sports Hall of Fame — coached a short-lived dynasty at Platte County, winning 64 of 66 games in a five-year span from 1999-2003. The run included three straight undefeated Class 3A championships with the Pirates an unquestioned small school powerhouse. In 2005, Platte County went back to the Class 3 semifinals but lost to Harrisonville. Three years later, the Pirates were in Class 4 with Utz taking over and leading them into the Suburban Conference. Platte County has remained solid but often come up just short of breaking back into the elite. The Pirates last made the playoffs in 2012 until making this year’s historic run, which I detailed in a story beginning on page seven of this week’s issue. This marked the sixth semifinal appearance in program history — all since 1999 — and almost incredibly Platte County won 11 or more games for just the eighth time in more than 100 years of football history. Maybe we all took the winning for granted. I’ve now witnessed four of the six state semifinals with Platte County as a participant. I’m not sure many have been there for all six, save for maybe longtime team statistician Craig Fisher. There’s some perspective to be gained from knowing the history. In 1999, an upstart junior class helped push Platte County into the state semifinals where Aurora — infamously known as the Houn’ Dawgs — pitched a 14-0 shutout on a windy day at pre-renovation Pirate Stadium. The Pirates finished 12-1, but there was belief good things were on the way. For the next three-plus years, no team won more than Platte County. In fact, Webb City won Class 4 state titles in 2000 and 2001 but didn’t match the three-peat. Who knew all those years later the teams would cross paths in a much different way. Since the coaching transition, Platte County has adopted a fast-paced spread offense. The Pirates face a more difficult schedule, including a slate this year that prepped them for a postseason run. Records have fallen in bunches during recent years with quarterbacks James Valentine, Justin Mitchell and now Tanner Clarkson and receivers Aliek Reed, TJ Guillory, John Watts and Devin Richardson. Some of the big numbers are a credit to a system that showcases the talents. The game of football has changed from when Platte County dominated with a pro-style offense that utilized a simple passing tree. The state championship teams were great — the best in program history — but there’s reason to appreciate the recent past. This current group might not have been the most talented, but 18 seniors helped push Platte County back to the playoffs. The Pirates will still want to end their losing skid to Kearney, but this season should bring about change. There’s belief now, and that can be powerful. Webb City prevailed. The Cardinals remain the standard in Class 4, deservedly so. Platte County won’t add to its history of state championships just yet, but they’re headed in the right direction. In high school football, there’s always next year, and next year, Platte County can start chasing history again with another shining example to follow.